If you’re in the Stevenage area this weekend (27th March), I will be attending the Cambridgeshire Cat Club’s 16th annual show. I will be continuing with my portrait of Amber and taking commissions. The show is held at Stevenage Arts and Leisure Centre, Lytton Way, SG1 1LZ. Yesterday I attended my first cat show! It was the Southern British Shorthair Show at Addlestone in Surrey and as I am owned by a British Shorthair myself I didn’t know where to look first. They are such beautiful cats in an amazing palette of colours as you can see from Poppy here…but more of her later. My lovely husband packed the car for me at 6:30 am while I prepared some lunch to keep me going. As ever I had decided to take the kitchen sink just in case. I don’t know about you, but when I was a child I went everywhere with a suitcase full of felt tips and crayons and pencils and paints…it’s still a bit like that now. So it’s not surprising that 8 trips to and from the car later I had managed to set up. 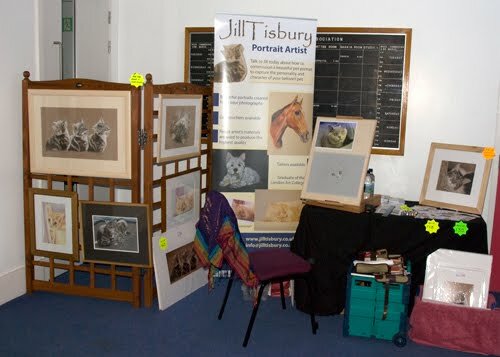 The organisers had placed me in the foyer just infront of the results frame, an ideal spot really. I have 2 pieces of sturdy trellis that are hinged in the middle. This provides an ideal frame work to show off a few framed originals. The tall pull-up banner was great value for money as people can see you from afar. I guess the most important thing is to make sure that you are drawing while you are there. People love to watch artists at work and this was no exception. Since competitors were there all day it gave them a chance to see a portrait evolve from the very start. The obvious choice for a British Shorthair show is a British Shorthair! My British Shorthair, Amber, to be exact (although she would contest ownership – in her eyes I’m on the staff). This is a great shot captured by John as she helped him to set-up in his photographic studio. (She was making sure he’d left nothing in the reflector bag). I decided to create the piece in pastel on velour – just ideal for cats, especially shorthair like Amber. I used a grid to transfer the drawing from the original to the velour, then started on the eyes. I love to do the eyes first as I can immediately start to see the piece coming to life. Next I blocked in some colour using soft Sennelier pastels. Finally I start working my way around the image layering the detail in with sharp Derwent pastel pencils and graphite pencils. This is as far as I got during the day. I spoke to so many people that I lost my voice by the end of the day. there was so much interest and it was so enjoyable. I’ll add the whole WIP to my main website as it progresses to the finished piece. Many of the compeitors came over to let me know how they were getting on and those who were competing for the first time were sooooo excited! Well Poppy was also attending her first cat show; in fact Popy was the first pet that her owner Kim had ever had. …And she won her class! Clever Poppy! Poppy’s mum has decided to celebrate with a beautiful comemorative portrait – quite right too. Once we’ve agreed on the right image work will start, so watch this space. The Fellowship of Professional and Amateur artists will be holding an Open exhibition at the Wellingborough Museum 7th – 14th Nov. I have entered 4 pieces and 3 have been selected for the exhibition! I’m so thrilled. The preview evening will be Friday 6th Nov. Click here for more details of the exhibition http://www.fpaa.co.uk/.